The GP14 Northern Area Championship was held at the club on 20/21 June. The forecast suggested there should be a good breeze to benefit good racing, and with a bit of luck racing would be over before the showers move in later in the afternoon. There was a fleet of 28 boats competing for the trophy, with six from Bass. After a hard afternoon’s sailing the sailors retired to the bar for a well earned drink or three. The visitors head the series overnight, with Dave and Jackie Gebhard taking the lead after race one and two, but Neil Platt, with our own Phil Smith crewing, in overnight lead with two firsts and a fifth. Mike Senior and Luke Shaw is second on equal points. 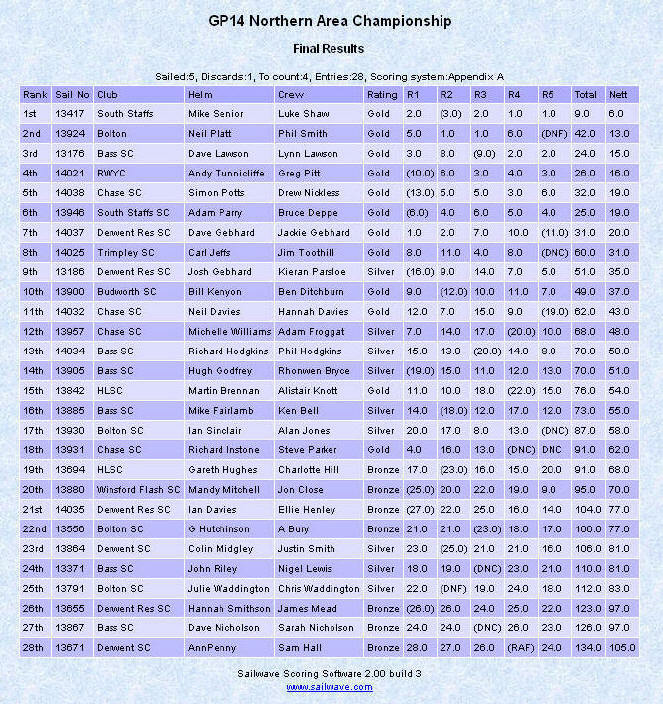 Best Bass boat is Dave and Lynn Lawson, presently lying in 6th position. Sunday started with a bit of an overcast morning, but what would you expect for the summer solstice?! The threat of rain had reduced, and the wind would be lighter than Saturday but there should be plenty to ensure there is a fair competition between those fighting for key positions. Just two races, but all to race for. Despite the forecast, the light winds resulted in a delay to the start of racing which is now underway. Mike Senior is the helm that took best advantage of the conditions in race 4 and he went on to win the race. After race 4 the only two boats in contention for the championship trophy were that of Mike Senior and Neil Platt. As the rain came in at the end of the race the wind filled slightly, and the fleet was very much split depending on whether they had taken the port or starboard side of the beat. Neil clearly must have taken the wrong side as he retired at the end of the beat leaving Mike the championship winner, who went on to finish the race in pole position. Locals Dave and Lynn Lawson had a good final race finishing in 2nd place and 3rd overall. Josh Gebhard and Kieran Parsloe of Derwent Reservoir sailed well, finishing 9th overall winning the silver fleet. Gareth Hughes and Charlotte Hill of Hollingworth Lake finished 19th overall and won the bronze fleet. As luck would have it, the sun came out as the race finished! !